Who the Hell Is Enrolling in Journalism School Right Now? A little more than ten years ago, I stumbled out of a liberal arts college with a mediocre GPA into a job with a weekly business journal with a smallish circulation in my hometown of Memphis, Tenn. I’d never studied business or journalism, and I came from a family of academics. I didn’t even really understand what a stock was. But there was something I loved about it. I had great editors, and I was learning a ton everyday about everything from how to get information out of people to where I was supposed to put a comma and where I was definitely not supposed to put a comma. Like most great careers, I just sort of fell into it, and I’ve been there ever since. I’ve covered everything from old money cotton brokers to Facebook, and I’ve met some of the most fascinating people in the world along the way. Also about a decade ago, one of my oldest friends had graduated with a degree in journalism and was doing an internship at the same paper. It was the late 1990s and everyone needed business reporters, so the job market was booming. It was in this environment that my friend decided to go to journalism school. She reasoned – as well-heeled professionals told her—that the sheer number of connections she’d get would ensure her a greater headstart in the job market than just spending those years working. Fast-forward and my friend no longer works in journalism. Meanwhile, I’m not only gainfully employed, but have managed to make more money every year the industry has declined all around me. I get to travel around the world looking for great stories. I’ve had the privilege of writing one book, and I’m mid-way through another one. Frankly, I’ve gotten farther in ten years than I thought I would in fifty. I like to joke that I’m “unqualified” to do my job. But I think it was precisely that total lack of journalism training that gave me an edge. I never worked the cops-and-courts beat. I don’t know how to write an inverted pyramid story or even really what that is. I do know how to write for different platforms, be scrappy and break news. I’ve had zero important alum connections and never got an internship at a big daily. And, in hindsight, that’s probably the greatest stroke of luck I could have had. Journalism schools are like foot-binding. They force you into a style that a bunch of dinosaurs all agreed was acceptable a zillion years ago. So in an age of blogging, you have no voice. In fact, if I were in J-school now, I’d have my knuckles rapped for using the rhetorical “you” in those last two sentences. Fortunately for me, my feet were never bound. 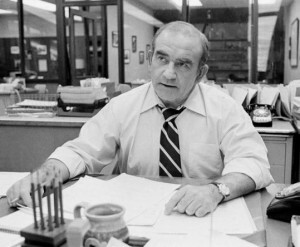 I use the rhetorical you with impunity and a great many other sins that would make a Lou Grant equivalent choke on his bad Styrofoam cup coffee. That means a lot of people hate my writing. It also means a lot of people love my writing. But guess what? Both of those make money in an online news economy. You know what doesn’t make money? Rewriting an earnings report according to a formula you learned from a book. Of course, this is all obvious by now, right? When I ask aspiring journalists where they want to be in ten or twenty years, not a single one says The New York Times or The Wall Street Journal. They want to have a famous blog. Some already do. So who the hell are all these people enrolling in journalism schools? Forbes has reported today that enrollment is soaring, even though nearly one-sixth of newspaper jobs have evaporated since 2001, and those left pay an average of $40,000 a year— just slightly more than journalism school will cost you. I know people do crazy things in a recession, but taking out a student loan for a degree that won’t give an edge in a wheezing industry actually makes getting an MBA look smart. It’s not that I’m pessimistic about the future for good journalists. Quite the opposite, in fact. Journalism isn’t dying; it’s just in a period of extreme volatility. And in any time of volatility, there’s huge room for opportunity. But you’re not going to learn how to exploit it in a stuffy classroom taught by people who got there by working at newspapers.